The City of Berkeley is taking a tougher stand on how it handles violent demonstrations and masked protesters. On Sunday, the city once again leaned on a temporary ban on items that could be used as weapons to try and keep the protests from turning violent. Melissa Colorado reports. 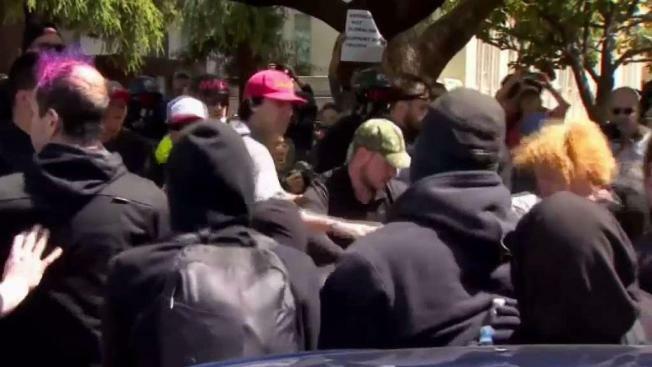 The City of Berkeley is taking a tougher stand on how it handles violent demonstrations and masked protesters. On Sunday, the city once again leaned on a temporary ban on items that could be used as weapons to try and keep the protests from turning violent. The mayor believes the tough tactics paid off, but there was still some damage done. Police arrested 20 people. Most of those arrests were for carrying banned items like hammers, pepper spray, pipes and rocks. NBC Bay Area's Melissa Colorado reports in the video above.